Losing star center Sidney Crosby and starting goaltender Marc-Andre Fleury for long stretches of the season figured to put the Pittsburgh Penguins' playoff chances in jeopardy. Instead, they are on the verge of their first Eastern Conference title in 14 seasons. The Penguins need a win over the Philadelphia Flyers to wrap up the top seed in the conference as the Atlantic Division rivals meet Sunday at Wachovia Center. Pittsburgh (47-26-8) is two points behind Montreal for the top spot in the East, but would win the conference with a victory Sunday because it would have 48 victories to the Canadiens' 47. Philadelphia (41-29-11), meanwhile, is headed to the playoffs after finishing with the league's worst record last season. The Flyers could finish sixth in the East with a win Sunday while a loss of any kind would leave them eighth and set up a first-round matchup with Pittsburgh. Losing Crosby, the reigning MVP and last season's scoring leader, to a badly sprained ankle on Jan. 18 figured to leave a nearly impossible void to fill. This time, however, it was second-year center Evgeni Malkin who elevated his game, collecting 14 goals and 22 assists in 21 games without Crosby. Malkin hasn't stopped producing since Crosby returned for the first time on March 4, and ranks second in the NHL with 106 points, trailing Washington's Alex Ovechkin (112). 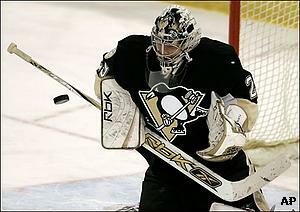 Losing Fleury in December to a high ankle sprain forced the Penguins to use Ty Conklin, who began the season in the minors, as their No. 1 goaltender for most of the next three months. Conklin, however, more than held his own, going 17-4-5 with a 2.19 goals-against average in 27 appearances. The long layoff appears to have been very positive for Fleury, who is 10-1-1 with a 1.58 GAA in 13 games since returning. "We ended up losing Crosby and Marc-Andre Fleury and so many other guys during the course of the season, and we were just trying to focus and maintain our position to make the playoffs," coach Michel Therrien said. "The guys surprised me with their commitment." Malkin has five goals during a four-game goal-scoring streak against the Flyers, and has six and nine assists in a seven-game point streak versus them. Crosby and Malkin combined for three goals and two assists on Wednesday as the Penguins clinched the Atlantic with a 4-2 home win over Philadelphia. It was the first division title for Pittsburgh since 1997-98, the season after Hall of Famer Mario Lemieux retired for the first time. A victory Sunday would give the Penguins their first conference title since 1992-93, the year they failed to win their third straight Stanley Cup. The Penguins appear to be peaking at the perfect time, going 4-0-1 in their last five overall games. They have been particularly good at home lately, winning eight in a row and compiling a 19-2-3 mark in their last 24 contests at Mellon Arena. Martin Biron stopped 22 shots for his fourth shutout of the season, and the Flyers clinched a playoff berth with a 3-0 victory over New Jersey on Friday. "I don't think I've ever seen a team play a better game that was so crucial," said chairman Ed Snider, who founded the Flyers. "They weren't afraid, they weren't nervous. They just took it to New Jersey." Philadelphia is also playing very well at the right time, going 6-1-1 in its last eight games. The Flyers have won four in a row and six of seven at home. Center Daniel Briere, second on the team with 72 points, sat out Friday with an injured left knee. His status for Sunday is uncertain. The Penguins lost the first four games of the season series against the Flyers by a combined score of 20-8, but have rebounded to win the last three by a 15-6 total.